We are a full service authority company specializing in all things paperwork when dealing with the FMCSA and USDOT. We know how to get the job done in the most efficient way with the FMCSA and State Agencies. From filing new authorities to reinstating old ones to requesting name changes, filing BOCs and more...we can help! If you are an Authorized For Hire Carrier, Freight Forwarder, or a Broker you must have a BOC-3 on file with the FMCSA/USDOT. We can assist with our easy online request form. For only $39 you can file your process agent form BOC 3 electronically with the FMCSA right here. Evilsizor Process Services LLC can assist you with your authority application process. Select the type of operation you wish to apply for and let us handle the rest. Authority packages start at $625. ​since 1990. Let us assist you too! This FREE ONLINE MINI-COURSE will help guide you through the interstate trucking application process and beyond. 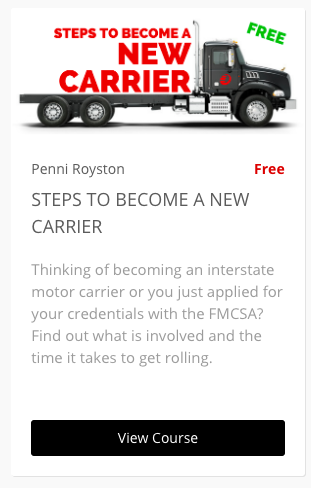 You will learn what pitfalls to avoid from Penni's 28 years of industry experience. Learn the steps it takes to get from the application process to your first trip and what is required from various federal and state government agencies. No where will you find such valuable information all in one spot like this online mini-course that's absolutely FREE! Attention Supervisors! You need this training! Ours is online and you choose when and where [as in your office or your favorite coffee shop or truck stop] you want to take this course.